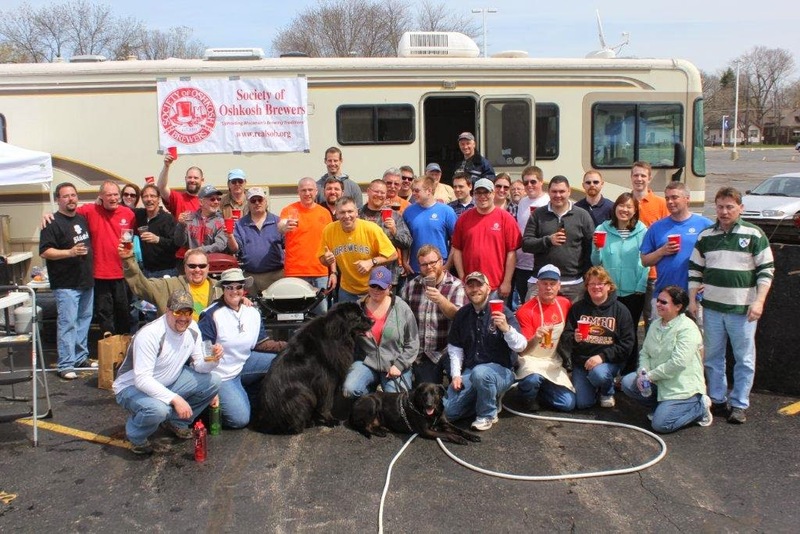 Oshkosh’s outdoor brewery returns this Saturday, May 3, when the Society of Oshkosh Brewers celebrate National Homebrew Day with a group brew in the parking lot of O’Marro’s Public House. The SOBs will begin firing up their kettles around 9 a.m. and will be brewing beer until just after 2 p.m. The Oshkosh homebrewing club encourages anybody with an interest in making their own beer to drop by and check out just how it's done. This is also a great event for folks who have been brewing for a while. It’s rare you get to see so many different homebrew set-ups and individual approaches to making beer in one place. HotDog Charlie's will be there serving gourmet sausages and, if you ask nicely, I’m sure you’ll find an SOB or two happy to share a taste of their homebrew with you. I’ll be there brewing up a batch of farmhouse lager, so if you go, stop over at my kettle and say hello. Brew on! A few weeks ago, I made a quick mention of this, but now that most of the details have been hashed out, here’s a more thorough rundown. 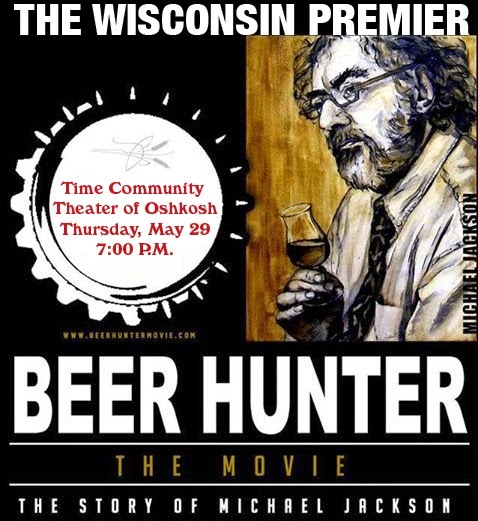 On Thursday, May 29, the Wisconsin premier of Beer Hunter: The Movie will take place at the Time Community Theater in Oshkosh. The movie starts at 7:30 p.m. Admission is $5 and there will be craft beer available at the theater to purchase and enjoy during the movie. You’re going to want to have a beer or two for this one. Beer Hunter is a documentary about life and times of famed beer writer Michael Jackson. It’s an excellent documentary and one that’s even more enjoyable when viewed with a crowd of fellow beer enthusiasts. I’ll post the trailer for the movie at the bottom of this post. It gets better... Prior to the movie, Gardina’s Wine Bar & Cafe will host a five-course, Beer Hunter Beer Dinner. Gardina’s is located almost exactly across the street from the Time, making for an easy stroll from your seat at the table to your seat in the theater. The Price of the Beer Dinner is $38 per person. That price also includes a ticket to the movie. The beer dinner begins at 5:30 p.m. Reservations are required. Reserve your spot by contacting Gardina’s at (920) 231-3516. View the full menu for the beer dinner HERE. Updates will be posted here and on the Facebook event page as we get closer to the date. Hope to see you there! 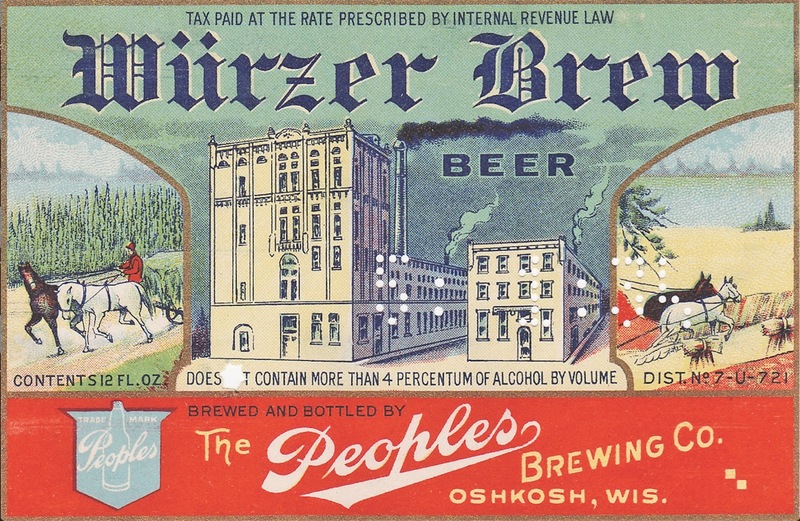 Here’s another example of a beer you might not expect to find in the lager-loving Oshkosh of the early 1900s. This ad from the Daily Northwestern of October 21, 1907 shows that Tom Ryan had put an imported Burton Ale on tap at his Clipper Club saloon on Main St. If you’re not familiar with the style known as Burton ale, don’t feel bad. Though this beer was widely popular all through the 1800s, it’s been all but extinct for almost 50 years. Burton ale is an English style of beer that was the forerunner to the barley wines and winter warmers we know today. The typical Burton ale was amber or darker in color. It was a bitter, sweet and strong beer ranging anywhere from 7-11% ABV. It was brewed to be a rich, "comforting" beer; a warming balm as the days grew shorter and colder. Our man Ryan was right on the mark putting it on in late October. 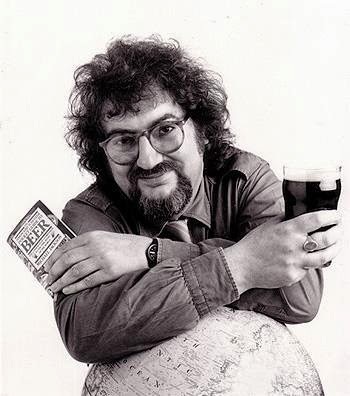 Burton ales were categorized as stock ales, implying that the beer has been aged at the brewery prior to its release. These beers were often allowed to mature for up to nine months, but sometimes for a year or more before leaving the brewery. I wish Ryan had told us who the brewer was. Though Burton upon Trent was the birthplace and primary source for Burton ale, the style was brewed outside of England as well, including in America. I can't close this without a few words about Tom Ryan and the Clipper Club. Ryan was born in 1858 in Reeseville, Wis. to parents who had emigrated from Ireland. He arrived in Oshkosh about 1885 and set up his first saloon here on the east side of Main St., between Waugoo and Washington, where the Chase Bank now stands. 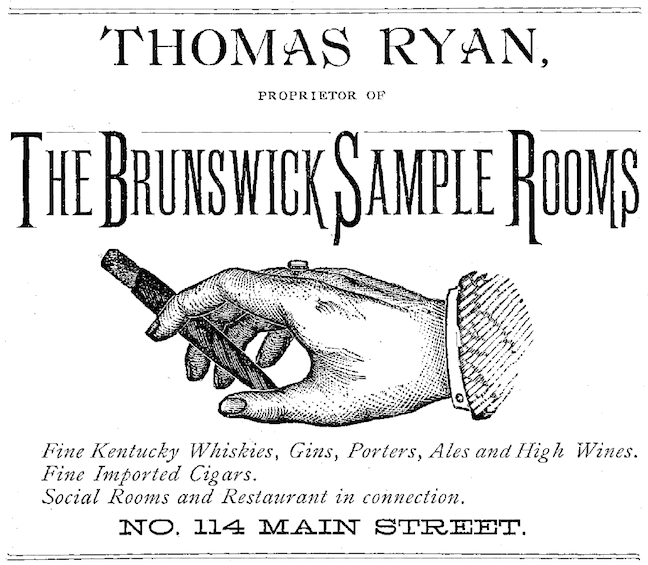 Initially, Ryan called his place the Brunswick Sample Rooms, but within a couple of years had changed it to the sportier Clipper Club. The Clipper Club was a classic Oshkosh pre-Prohibition saloon. It was known as a sporting man’s resort where pictures of racehorses and boxing greats hung from the walls. Ryan himself was a boxing promoter and staged numerous matches in Oshkosh. Prohibition spelled the end of the Clipper Club, but you can still get a glimpse inside the old saloon. Below is an interior view of Ryan’s stand showing Ryan at the back-end of the bar in a white coat mixing a drink. For a better look, stop in at Oblio’s. 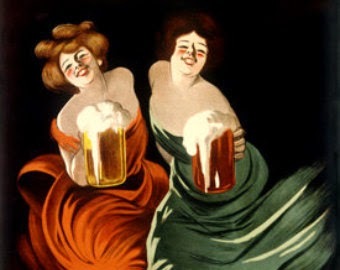 A much enlarged print of this picture has been hanging from a wall in the main bar room at Oblio’s for years. It’s good to see one of the great Oshkosh saloons of the past memorialized in one of the greats of today. A couple of choice maibocks here today, but before we get into them let’s take a quick look at the lineage of this style. Maibock is the baby of the bock family. It’s a German style of golden lager that came into being in the second half of the 19th century. The style is a variant of the earlier, darker bocks and is believed to have originated in Munich at a time when Bavarian brewers were just beginning to produce barley-based beers that were lighter in color. But don’t mistake this for a light beer. Traditionally served in spring and for May Day celebrations, maibock (i.e., May bock) is a rich, bold style of beer with enough strength to take the chill off during these damp, spring days. With May breathing down our neck, now’s the time to uncork this spring tonic. Last week, Kirby Nelson – brewmaster for Wisconsin Brewing Company – was in town giving a talk to the Society of Oshkosh Brewers. He said that when he’s creating a beer recipe, foremost in his mind is a beer that will be balanced and amiable; one that continually invites you back to the glass. He definitely hit his mark with this one. Big Sweet Life is the fifth release from the six-month-old Verona brewery and it has Nelson’s signature all over it. The beer is brilliantly clear and golden hued with a tight, white lid of foam. A toasted bread and honey-like aroma is cut by alcohol aromatics that come off as slightly smoky (reminded me of some meads I’ve tasted). The mouth feel was lighter and sprightlier than expected, but it works well with the nut-like, toasted bread flavors of the malt. A fairly prominent bitterness rises in the finish, which I personally love. One of my favorite maibocks is Primator from the Czech Republic. That beer features a similarly assertive bitterness. I find it very appealing in this style. 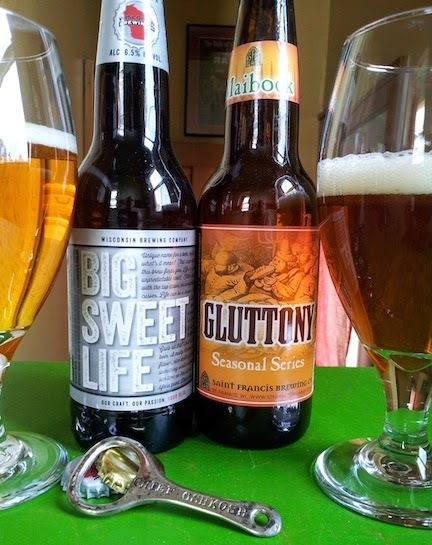 Big Sweet Life delivers a well-hidden 6.5% ABV; just right for beer like this. This is definitely my favorite beer thus far from Wisconsin Brewing. I’ve seen Big Sweet Life available in Oshkosh at Festival Foods and the North Side Pick n’ Save for $7.99 a six pack. The Saint Francis Brewery opened in the spring of 2009 as a brewpub. Its first brewmaster was Al Bunde, who just so happened to be the first brewmaster at Fox River Brewing, here in Oshkosh. Bunde has since moved on and St. Francis has moved into selling its beer around the state. Their bottled beer is actually brewed at Sand Creek Brewing in Black River Falls, where they’re still using some of the old packaging equipment from Oshkosh’s Peoples Brewing. Lotsa connections here! OK, let’s get to the beer. Gluttony pours to a sparkling copper with a pillowy, cream-colored head. The draw is soft on the palate, with a lush malt flavor. The beer isn't overtly sweet, but caramel and soft cookies came to mind as I drank it. Minimal hopping leaves the malt to shine from start to finish. The ABV isn't listed on the bottle, but I'm guessing Gluttony leans to the plus side of 6% ABV. A flavorful, satisfying beer that’s suited for you malt heads out there. You can get your Gluttony in Oshkosh at Festival Foods where they sell it for $7.99 a six pack. One last thing: maibocks are great food beers. A juicy brat slathered with Düsseldorf mustard would be an obvious pairing, but consider taking either of these beers with a spicy Mexican dish or a pizza thick with the peppery sauce that they do so well at Ratch & Deb's or Dr. Benzie's. 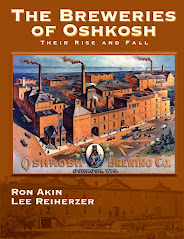 By the 1880s, the German brewers who had settled in Oshkosh had made the city into a wellspring for lager beer. But there remained drinkers here who thirsted for something other than the German-styles that flowed from the city’s six breweries. William H. Englebright saw opportunity there. He began importing the ales of his English homeland to Oshkosh. Englebright was born in 1857 at Norfolk, a county in the East of England. He was schooled in England and was 16 when he arrived in Oshkosh. He found his way into the saloon trade here and at 22 was managing Overton’s Sample Room, a basement saloon and billiard hall beneath the Beckwith House at Main and Algoma (currently the New Moon Cafe). Following the deadly Beckwith fire of December 3, 1880, Englebright partnered with Frederick B. King. The two acted as co-proprietors of the Tremont Hotel Sample Room at the Northwest corner of State and Waugoo (the building was razed in 1962). In August 1885, Englebright and King dissolved their partnership. They had recently established a second saloon at Main and Algoma (the space occupied by the sun dial in Opera House Square). King remained at the Tremont and Englebright took the stand at Main and Algoma. Englebright named the saloon the Star and Crescent Sample Room and made it into a place where Oshkosh’s upper crust would feel at home. An 1886 advertisement for the saloon paints it as a genteel retreat. what is demanded in a first-class trade. 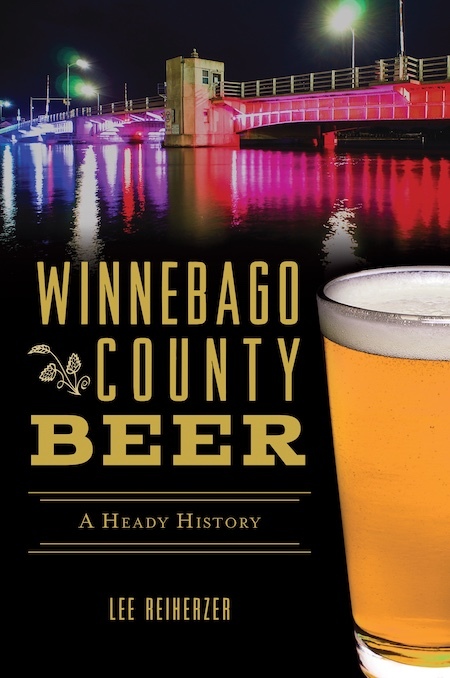 In addition to acting as an international travel agent, Englebright traded in “fine whiskies, together with his extensive supply of wines, also porters, gins, tobaccos and smokers' articles.” A far cry from the German beer halls that Oshkosh was coming to be known for. 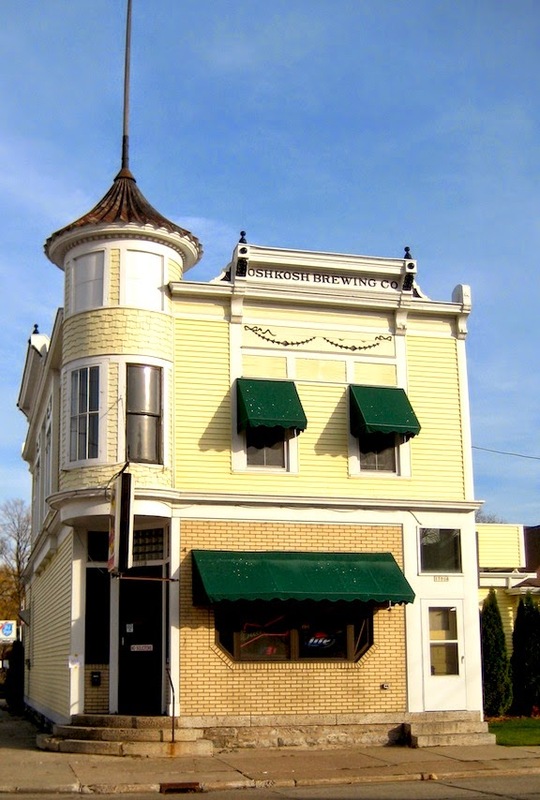 The Star and Crescent Sample also became the “Headquarters for Bass English Ale” in Oshkosh. Englebright sold the ale on draught and for him it may have represented the most urbane of refinements. Englebright was raised in rural England at a time when Bass Ale was coming to be known as the beer of choice among the cosmopolitan set. It was not an especially popular beer in England, but it was one that indicated good taste. And how did it taste? Probably very little like the Bass Ale we drink today. The English pale ales of this period, most famously those from Burton upon Trent, were strong, golden beers that were aggressively hopped. In England, it was referred to simply as “Bitter” and bitter they were. The Bass Ale that Englebright sold in Oshkosh would have featured a level of hop bitterness that would more closely resemble a modern IPA than that of a pale ale. That Englebright had chosen Bass Ale as his featured brew is not surprising. 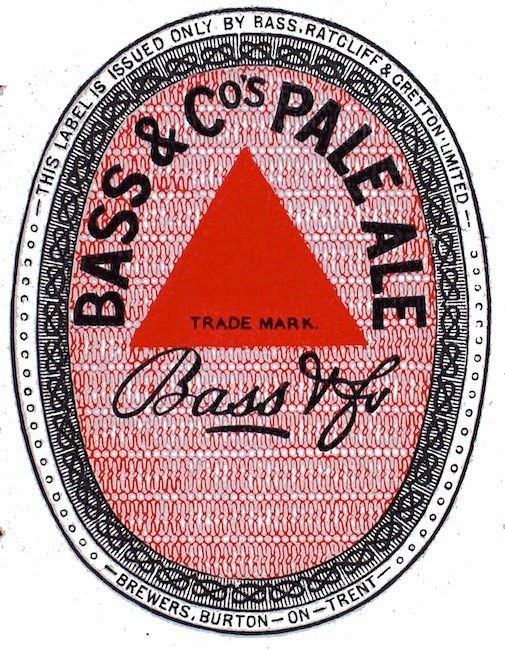 By the 1880's, Bass had become the largest brewery in the world producing nearly a million barrels of beer annually, with large quantities exported to America. Perhaps more importantly to Englebright, Bass represented the sophisticated image he was so eager to project. But the worldly atmosphere at the Star and Crescent Sample Room lasted only as long as Englebright’s tenancy there. 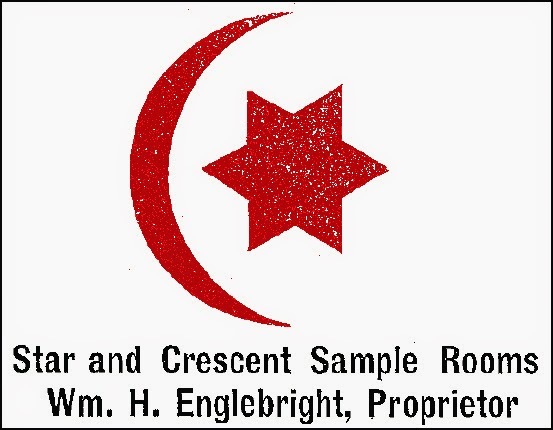 In 1890, Englebright sold the Star and Crescent to Fred King, his old business partner. It wasn’t long before King had replaced Englebirght’s porters and Bass Ale with Pabst and Budweiser. In the winter of 1900, Englebright left Oshkosh for Ripon, where for 18 years he operated the Hotel Englebright. There the dapper Englishman had an ear ripped off in a freak accident after falling into a set of swinging doors. Englebright went to Sheboygan in 1918. He continued in hotel management there until returning to Oshkosh in 1926. Englebright died in Oshkosh in 1940 at the age of 82. His death came after falling and fracturing his skull while sweeping snow from the walk at his house at what is now 633 Amherst Ave. His obituary in the Oshkosh Daily Northwestern describes a talented man of accomplishment. Unfortunately, the paper neglected to mention that Englebright was also one of the early advocates for bitter beer in our city. 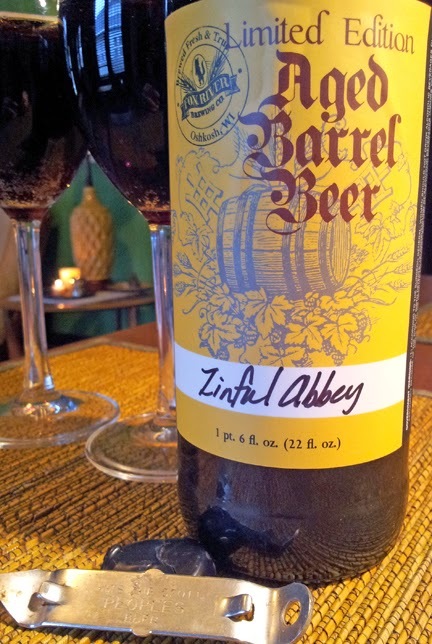 What: Zinful Abbey by Fox River Brewing Company. This is Fox River’s Abbey Normal, their Belgian-style dubbel, aged in an oak, wine barrel. The barrel had previously been used for Jack London Zinfandel of the Kenwood Vineyards, a Sonoma Valley winery. This beer has been in the works for just under a year. It is the first of the beers to come out the barrels nested at the entrance to the brewhouse inside Fratellos. Where: Wax-dipped bombers (22 oz.) are available in the beer cooler at Fratellos in Oshkosh for $13. Why: Because it balances complexity with drinkability in a wonderful way. The beer pours to a dark ruby color with a thin, tan lid of foam. The aroma is heavy with fruit; fig, raisin and blackberry most prominent. If you were blindfolded and put your nose to this beer, it’s likely that you’d guess it was wine. That vinous character continues in the flavor. Modestly carbonated for an abbey-style ale, the beer is more fruity than malty. A host of wild berry flavors come through on the front end. The blush of fruit is followed by an oaky tartness mingling with spicy black pepper that makes for a warm, pleasing finish. I’m guessing this is somewhere in the neighborhood of 8-9% ABV, though it drinks much lighter than that. If you decide to try this, plan a meal around it. This is truly a food beer. Roasted chicken or pork would be an ideal pairing. À votre santé. The front end of the week has some good looking beer events going down in Oshkosh, let’s check them out. Tonight, they’ll unbung a firkin full of Central Waters "Illumacolada," which is actually CW’s Illumination Double IPA seated on coconut and pineapple juice. This is rare beer and likely to be your one shot at tasting it. The firkin beings flowing at 6 p.m. For more info and tasting notes go HERE. As of yesterday there were still a couple seats open for this one. The Dublin’s crew welcomes in 3 Sheeps Brewing of Sheboygan for a five-course meal with each course paired with a different 3 Sheeps brew. Dinner begins at 7 p.m. Tickets are $30. Contact the pub at (920) 385-0277 to confirm availability. See the Dublin’s Facebook Page for more. The storied brewmaster of Wisconsin Brewing Company stops in Oshkosh to visit with the SOBs and talk beer. This is a regular club meeting, but the public is invited to attend. If you’re curious about homebrewing and want to find out what the SOBs are all about; this would be the time to check them out. Plus, you’ll get to meet one of the doyens of Wisconsin craft beer. The gathering begins at 7 p.m. sharp at O’marro’s Public House. 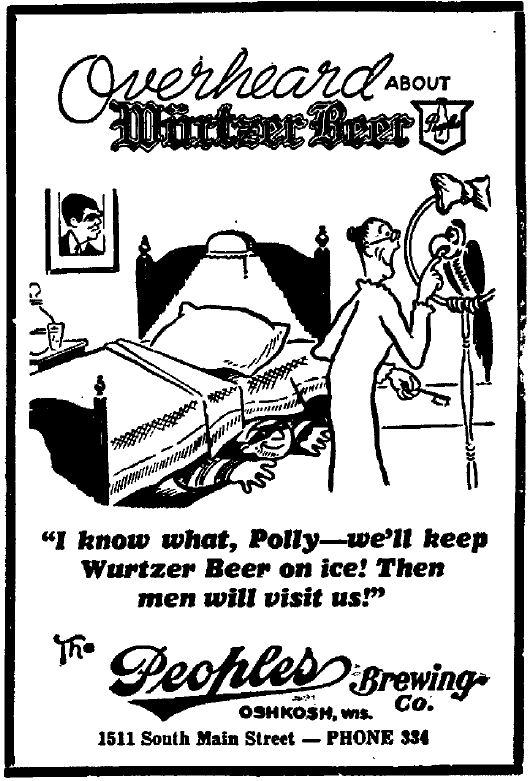 What we have here today is a good example of the lousy state of beer advertising in the 1930s. When Prohibition ended in 1933, brewers generally resorted to the same sort of advertising tactics that had worked for them in the past. They spouted off about the quality of their beer, how pure and healthy it was, and how delicious it tasted. That approach no longer worked. Much had changed since 1920 and telling people that you made the sort of beer that their fathers used to drink wasn’t what they wanted to hear. Brewers needed something snappier to draw in those who had spent the previous 13 years swilling bootleg hootch in speakeasies. So they ditched the appeal to reason and went straight for the funny bone. And usually missed. What in hell is that supposed to mean? First thing I thought was that the guy in the top hat was a pimp with a limp plan for drawing in customers. He certainly dresses like a pimp and the lady next to him looks none to happy about the situation. Turns out I was wrong. A week later, Peoples came out with another ad that cleared up the confusion. This one is even less humorous. See what happened here? Someone in the composing room added the wrong script to the first cartoon. I wonder if anyone even noticed. Or cared. Want more non-funny beer funnies? Allow me to oblige your demented sense of humor. HERE’s one for the Oshkosh Brewing Company from 1938 featuring the holy trinity of comedy: racism, imminent death and cannibalism. And HERE’s a 1935 ad from Rahr Brewing that is absolutely levity free, though it does recall those grand old days when “Petting Parties” were all the rage. Enjoy. For the April edition of the Oshkosh SCENE (find yours here), I wrote about O’so Brewing and a few of the new things they’re doing up there in Plover. Luckily, we don’t have to just read about it. A couple of the specialty beers that O’so has recently produced are now available in Oshkosh. If you’ve already made up your mind about O’so, think again. Here are two beers that will have you looking at the brewery in a different light. Since I covered it when it first hit town, I won’t go too deep on this one, but here’s a quick recap. Winds is a blend of fresh and aged pale ales fermented with brettanomyces then matured in oak barrels. It’s an especially refreshing, sour ale that merges the American Pale Ale style with the Belgian sour-beer tradition. The two work together wonderfully. And at 5.5% ABV it’s eminently drinkable. Winds is available in the packaged beer section at Gardina’s, where it’s sold in 750 ml bottles for $12.99. This is a beauty. They started with O’so’s Night Train Porter and built it up with coffee and vanilla to produce one of the best dessert beers I’ve come across in ages. It pours nearly black with a frothy tan head and an aroma so fragrant you’ll notice it before you raise the glass. Caramelized sugar, vanilla and coffee are prominent in the nose with background notes of roast and chocolate. The mouthfeel is soft and creamy; the flavors intensely rich. Sweet caramel wrapped around coffee and boozy vanilla are followed by firm, roast-malt tannins that keep the beer from becoming cloying. The flavors are so beautifully integrated that I could even see a non-coffee drinker going for it. I liked Winds of Change quite a bit, but this might be the best beer I’ve had from O’so. It would be the perfect dessert after a spicy meal. Then maybe a nap; it’s just over 10% ABV. Don’t miss this one. 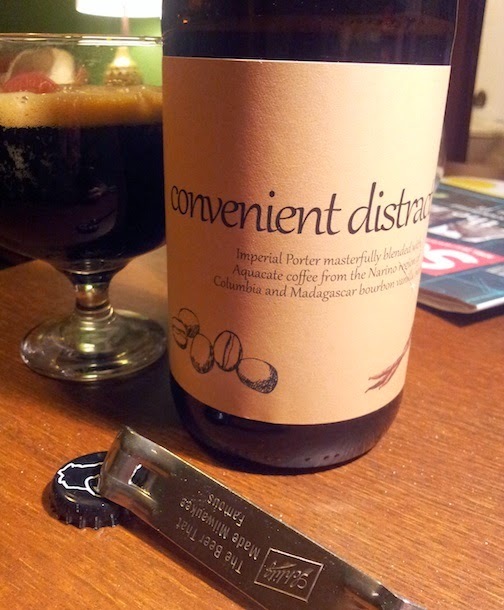 Convenient Distraction just hit the shelf at the retail store in Gardina’s, where they sell it in 750 ml bottles for $12.99. If you’re a homebrewer who kegs their beer, here’s a brew that might pique your interest if not your palate. 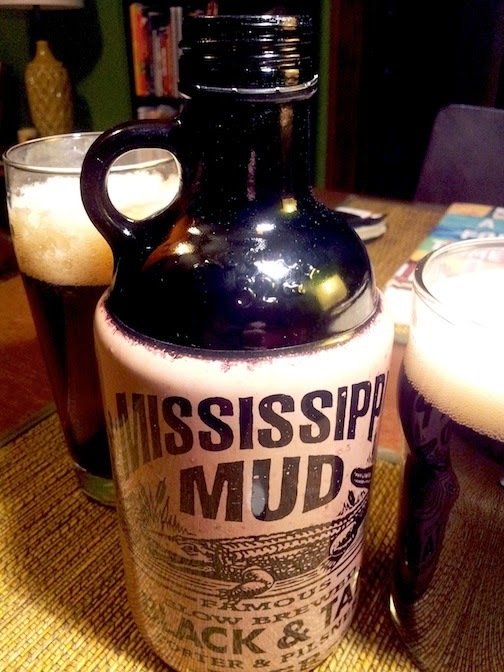 Mississippi Mud is nothing special, but the 32-ounce howler (half a growler) they sell it in is fantastic. It’s the perfect jug for those times when you want to take some homebrew along with you, but don’t want to pull a full, half-gallon growler off your keg. The gimcrack label is just plastic wrap that takes about three seconds to tear off. Drain the beer and you’re all set: you have yourself a nice little howler that’s about a buck cheaper than those sold at homebrew shops. Festival Foods in Oshkosh sells these for $3.99. The low-end price at a homebrew shops would typically be about $4.99... and that’s without the beer. I suppose as long as we’re here, we ought to taste some beer. They’re calling it a Black & Tan, which in this case amounts to a blend of porter and pilsner. It pours dark brown with a light, fluffy head. The aroma is neutral with a hint of roast malt peeking back at you. The beer is easy drinking and light with a faint sweetness. The roast comes up as it warms; as does an unpleasant metallic note. Drink it fast and don’t worry about it. You just picked up a nice little howler and maybe a wee buzz. No point in analyzing that. Just feel good. If you had walked into August Witzke’s Oregon St. saloon one hundred years ago and ordered a bottle of beer, you would have met with this attractive label. 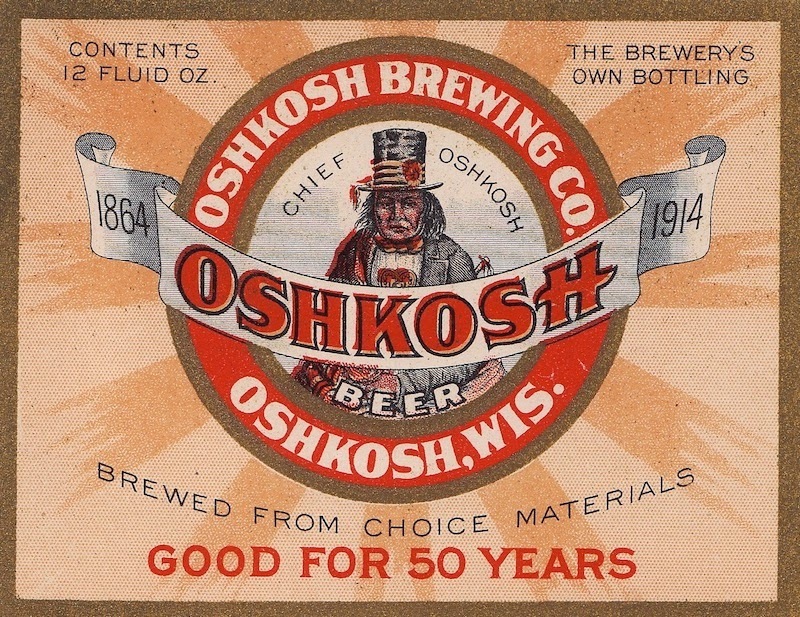 In 1914, the Oshkosh Brewing Company began bottling their beer under this label to commemorate their 50th year of making beer (actually they were off by a couple of years, but we’ll let that slide). 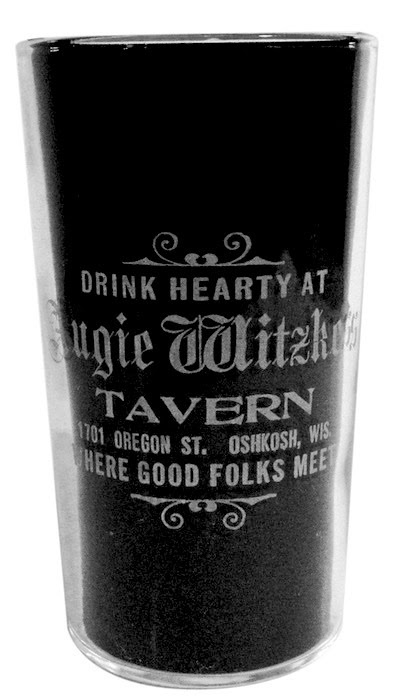 The bottle would have been handed over the bar to you by August “Fuddy” Witzke who just that year had become proprietor of the saloon. He would have given you an “Oshkosh” because it was the only beer Fuddy sold. 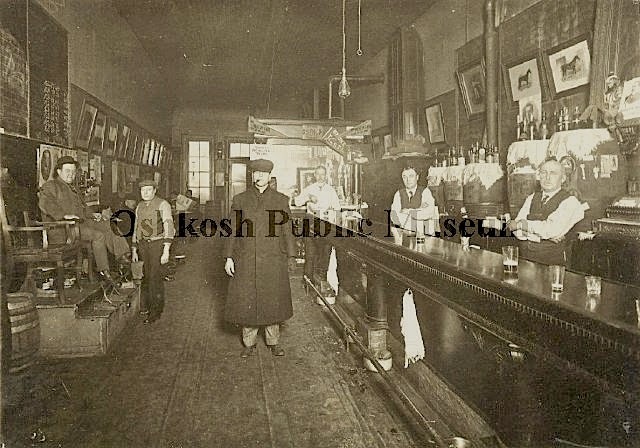 His saloon had been built by the Oshkosh Brewing Company in 1902 and in 1914 the brewery still owned the property. Fuddy Witzke’s place was a tied-house, meaning he had an agreement with the owners of the property to sell no beer other than theirs. Fuddy would have probably offered to pour that beer into a glass that looked something like this. Witzke’s is still there at the corner of Oregon and 17th street and the name of the original owner of the property remains on the building. 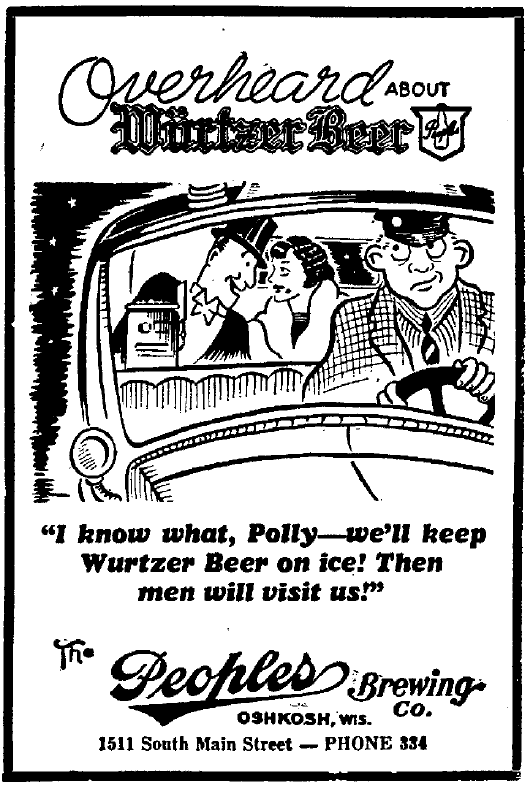 Fuddy Witzke died in 1969. Two years later, the brewery that put him in business failed. After all these years, it’s good to see that their names remained tied together. Here’s one of the best American-brewed Saison’s I’ve had in a while. This comes to us from Brewery Ommegang of Cooperstown, New York where they’ve made a name for themselves brewing Belgian-style beers. In fact, the brewery is owned by Belgium-based Duvel Moortgat. This beer has all the marks of a classic Belgian saison. A hazy, light-golden beer with a ripe, fruity aroma, Glimmerglass pours a massive head that’ll keep you waiting to get to the liquid under the suds. When you finally make it through the gate, you find a soft, bready malt character under bright, floral hop notes complimented by a dash of peppery spice. It’s a slightly sweet beer, but very crisp and refreshing. This would be a great ale for a warm day. At 5.4% ABV, you’ll want a couple. Glimmerglass is available in 4-packs at Gardina’s in the packaged beer section for $10.99. By the way, the next time you’re in the beer store at Gardina’s, check out that shelf full of Belgains. There are some amazing bottles of beer there. You don’t see many Wisconsin breweries attempting Dubbels. Every now and then you’ll find one at a brewpub, but it’s a style our production breweries seem reluctant to tangle with. That’s odd. You’d think that with it’s big malt profile, a good dubbel would be just the sort of beer Wisconsinites would cotton to. Anyway, here we have one from the vaunted, not-so-little brewery in New Glarus. Like a good dubbel should, this pours to a brilliant, deep amber with a rocky, tan head. The yeast character informs the aroma with generous amounts of dark fruit backed by caramelized malt. The beer is highly effervescent with a surprisingly light mouthfeel. The flavor amplifies the aroma: raisin, apple, toffee and maybe just a hint of funk hanging around in back. The beer finishes dry with a warm spiciness. Take your time with this beer and don’t drink it cold; you’ll miss what’s so good about it. This 7.8% ABV ale is available, among other places, at Festival Foods where it’s sold in 4-packs for $9.49. Let’s bring out the big gun. 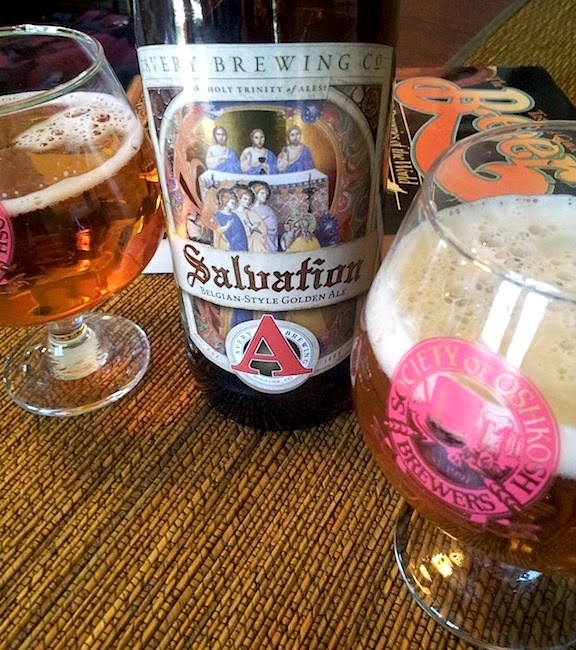 Avery’s Salvation is a 9% ABV Belgian strong ale that’ll put your stamina to the test. At first blush this bright, golden beer seems easy going with a playful aroma of juicy pineapple and baseball-card bubblegum. The beer has a soft texture delivering a sweet and creamy malt flavor mixed with apricots and pears. After a few good draws, though, the beer begins to show its heft. A candy-like thickness comes around and an interesting alcoholic bite appears in the finish. By the end, it takes on a cough-syrup like texture and after one glass you’ll have had enough. Or maybe not, depending upon what you’re aiming for. Definitely a beer to check out and it’s nice to see Avery's beers back in our neighborhood again after a three-year hiatus. Avery Salvation is available at Festival Foods in Oshkosh they sell 22oz. bombers of the beer for the sweet price of $6.99. We have a good crop of beer events hitting town in April and May. Get your beer calendar out and let’s fill ‘er in. Part four of this go-round of Barley and Hops' Beer Sampling Series starts at 7 p.m. You can get tickets at the pub right up until they ring the bell. All the details are HERE. Oblio’s Lounge will welcome Alaskan Brewing Co. from 9-11 p.m. They’ll be handing out samples of Alaskan’s Hopothermia Double IPA, Amber Ale (Alt Beer), Freeride American Pale Ale and Summer Ale (Kölsch). Chapter 9 of Gardina’s Beer Bar Series will feature a firkin of Central Waters Illumination Double IPA racked onto coconut and pineapple... an Illumacolada, if you will. The firkin starts flowing at 6 p.m.
Wednesday, April 16: 3 Sheeps Beer Dinner at Dublins. Sheboygan’s 3 Sheeps Brewing and Dublin’s Irish Pub are teaming up for a beer dinner at the pub. 3 Sheeps beer will be paired with gourmet food prepared by the Dublin’s crew. Dinner starts at 7 p.m. Tickets are $30 and available at the pub. Checkout Dublin’s Facebook page for updates. The SOBs will host their annual communal brew in front of O’Marro’s Public House. The public is invited to see how beer is made and find out what the SOBs are all about (and don’t be surprised to find a few homebrews passed around). The brewers will set up around 9 a.m. and the brewing will run until approximately 3 p.m. Visitors are free to wander in, out and all about at their leisure. Beer Hunter, the documentary about the life of beer writer Michael Jackson, will make its Wisconsin debut at the Time Theater in downtown Oshkosh on Thursday, May 29 at 7 p.m. Adam Carlson of Gardina’s is driving this event. There’ll be more info to come in the near future.